DriverIdentifier is a semi-automatic solution to find outdated drivers from your PC. The program will scan and will display a list with drivers that need to be updated, but after that the download link goes to the developer's homepage where you need to download it manually. Also, is possible that you will see a list with downloads and you must figure out which version is good for you. The program is small and runs quickly. If you don't know exactly what hardware do you have, you can use Sandra Lite (free) program to display this info about type of hardware, CPU, network card etc. The program doesn't offer any other option. 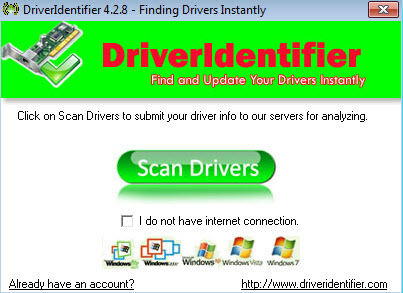 DriverIdentifier is available as free download for Windows 32-bit and 64-bit.